After escaping the inevitable for some time, winter has finally come to Chicago. While my husband and I can easily throw on an extra pair of socks or a sweater, our cats aren’t nearly as lucky. Even if your cats live only indoors, the cold weather can still impact them. Here are some ways to make sure your cats remain comfortable throughout winter. Making sure your cat stays warm begins, of course, with your cat — on the inside and out. It takes more calories for your cat to stay warm, so don’t fret if you see him eating more food than usual throughout the next few months. Feel free to leave out a little extra if he seems especially hungry. If you think his appetite is leading to a significant weight issue, consult your veterinarian. Some folks also recommend giving your cat extra vitamins like vitamin E and B-complex, which they say will strengthen your cat’s tissues and make him more resistant to the cold. However, first check with your vet about your cat’s specific dietary needs, as some supplements can cause imbalances and medical problems. And of course a balanced diet leads to a thick and healthy coat, which is probably the most obvious way your cat stays warm. But your cat may need a little help in this department, too. Continue to groom your cat and make sure he’s mat-free throughout the winter as mats reduce the fur’s ability to properly insulate him. If you have a serious matting issue, consult a professional groomer. Then of course there are several things you can do around your home to make your cat more comfortable. The first place you can start is your cat’s bed. Donut beds, tented beds and other cozy-looking beds will help retain your cat’s body heat to keep him warm. If possible, move it away from doors and drafts and keep it off the floor, or at least on a carpet or folded blanket for a little extra insulation. All are available at Petsmart.com; some even come with their own heating pads. If your cat isn’t a fan of cat beds (the more expensive it is, the less they seem to like them! 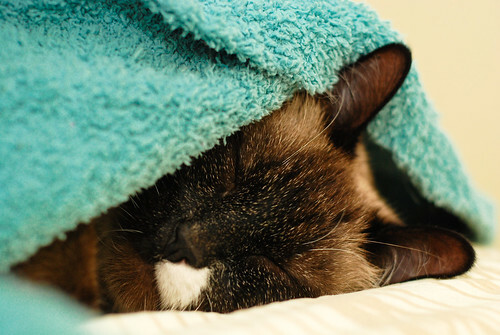 ), consider adding a warm blanket to their favorite sleeping spots. Some like to burrow into the blanket to stay warm. Cold weather can also be particularly difficult for elderly and arthritic cats. The cold makes their joints especially stiff and tender, which can make life a bit more awkward and complicated than usual. Be particularly gentle with your cat, and try to modify his environment to make life a bit easier. Some ideas include placing a warming pad under their cat bed (on low, when you’re home to supervise) and moving furniture so it’s easier for them to get around (a foot stool in front of your couch as an extra step up, etc.). Also watch them carefully as they climb or jump, as they may have trouble getting around, resulting in more falls. If you have to take your cat on a trip during the winter, there are a few things you can do to make it easier for everyone. If possible, start your car a few minutes beforehand so it can get warmed up. Next, toss your cat’s bed or towel in the dryer for a few minutes so it’s nice and warm when you put it in his carrier. Lastly, cover his carrier with a blanket or towel as you walk outside with him to cut back on the wind and cold. Your cat will definitely appreciate it! What are some of the ways your cat likes to stay warm during the winter? Do you do anything special for him? Please share in the comments! Lily, my little Siamese mix likes to lie directly on the heat vent on the bathroom floor. My CH kitty Faith has taken to doing the same thing on the bedroom heat vent. My husband calls this “winter grilling”. I try to get my cat under the covers or somewhere warm, but she won’t have it. She spends time in her little igloo, but mostly she stays on the back of the sofa, and it is really, really cold in my house, a former summer house with bad insulation! I worry about her. My cat does not like the feel of some “blankets”. She seems to prefer a bed sheet or smooth bedspread underneath. Her favorite is an old futon slip. The top covering can’t be too scratchy and she often burrows under creating an igloo that lightly covers her. I’ll also create layers which she seems to prefer. My advice is to offer choices to find out which works best. My cats Oreo and Moochie sleep under the covers with me! Especially Oreo the smaller of the two.